Chandana Art Foundation International invites Indian children to participate in the 6th International Arts Olympiad. The world’s largest and most prestigious arts initiative organized by “International Child Art Foundation (ICAF) – Washington DC (www.icaf.org)” every four year once for 8 to 12 year - old children, the Arts Olympiad begins in classrooms like your own and leads to national and international educational events where children learn universal values, acquire peace leadership skills, recognize the powers of their collaborative creativity, initiate lifelong friendships and make a commitment to promote tolerance and coexistence. 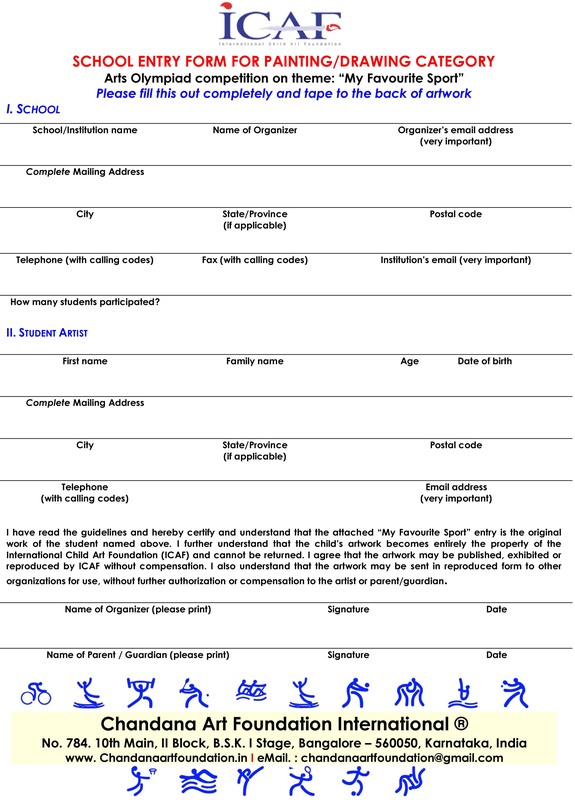 The information appended below will help you introduce your students to the Artist-Athlete Idea, the power of a creative mind in a healthy body. We can reap enormous benefits tomorrow. Developing our students’ creative-thinking skills and physical fitness can both advance economic prosperity and reduce incidences of expensive social ills such as obesity, crime, and violence. We request that you kindly submit your school’s entries (one best painting or drawing, and one best digital artwork, if your school has access to computer art programs) as soon as possible, but certainly before December 31, 2017. A National level exhibition will be held in early 2018 will display the schools’ best artworks so that a panel of judges can select your Arts Olympiad winners. The CAFI will invite winning artists to represent the country as “Official Delegates” to the 6th World Children's Festival in Washington, D.C. in the summer of 2019. The WCF provides students with a transformative experience critical to their growth as global citizens. We look forward to your school participating in the 6th Arts Olympiad and the 6th World Children’s Festival. We hope your students’ artwork will be part of the International Arts Olympiad Exhibition, which will travel to major cities in 2020 to celebrate the Tokyo 2020 Olympics. Each student should write a short essay on his or her work, describing their feelings and creative objective, and comparing their work in relation to the artwork of peers. This paper should be clipped to the artwork. Students are to create art on the theme, “My Favourite Sport”. They can select any sport to picture themselves as “artist-athletes.” The sport can be a local, traditional or an Olympic sport, or one that they imagine. The students can produce a painting/drawing or digital art. The artworks produced under the Arts Olympiad will be exhibited at local venues, providing an opportunity for communities to celebrate their children's creativity. 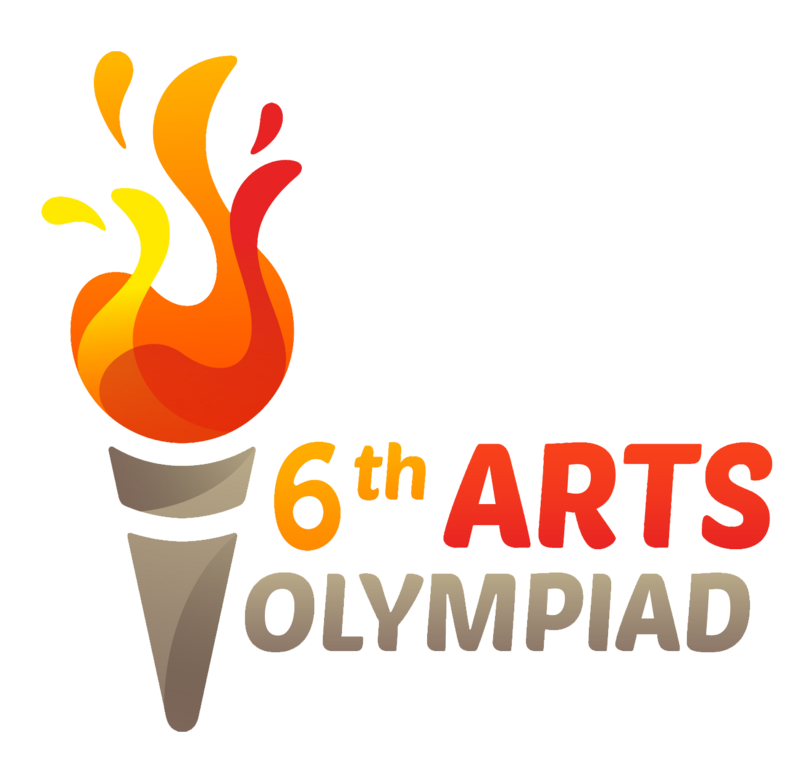 Distinguished panels of judges, which include schoolchildren, will select one best painting and one best digital art piece, thereby designating the young artists as the 6th Arts Olympiad winner. The CAFI plans to organize the National Arts Olympiad Exhibition in the capital city so that two winners of the Arts Olympiad can be selected, who will represent India at 6th World Children’s Festival in 2019 in Washington, D.C.
Organize an art competition on the theme My Favourite Sport into which the students combine the themes discussed in class. Encourage students to be creative with the topic, particularly those who do not see themselves as athletic. Ask them to look deeper into the sport than just the actions themselves; ask them to look at the message, movement, and values that are related to sports. Students may choose to represent a native sport, or a sport they like to play or watch, or they may invent their own sport, etc… If possible, involve the athletics instructor, with energy and passion, the very act of making art can be an athletic activity! The World Children’s Festival is held every four years as the Olympics of children’s imagination and co-creation. The 6th World Children’s Festival will take place in the summer of 2019 at The National Mall in Washington, D.C. The world’s leading international children’s educational event, the WCF is free and open to the public. ICAF will not charge or it supports financially the Partner or Partner country delegation any registration fee for participation in the WCF. The Official Delegations to the World Children’s Festival are Arts Olympiad winners (elementary and middle school students), their parents, school principals and teachers.